Voices of Scott Backula, Jasmine Guy, Natalie Cole (singing), George Kennedy, Hal Holbrook, Rene Auberjonois, John Rhys-Davies, Kathy Najimy & Don Knotts. Other animation-producing studios are forever playing catch-up to Disney, usually without much success. Disney's animation art is exemplary. The stories in its films are usually enough to hold kids' and grown-ups' interest, and its music has traditionally been Oscar fodder. So what's a competitor to do? Warner Bros. had a great idea -- scrap all that and just make a cartoon. "Cats Don't Dance" doesn't have grandiose animation or a chart-topping soundtrack. It doesn't have top stars voicing the leads and it will never have a Broadway musical spin-off. But unlike Disney's recent efforts, "Cats Don't Dance" is fun without pretension. Nothing more, nothing less -- just a great Saturday afternoon matinee. It is the tale of Danny, a farm cat from Indiana with a penchant for song and dance who goes to Hollywood to realize his dreams of stardom, oblivious to the fact that Hollywood isn't casting critters in starring roles. Voiced by Scott Bakula, best known for his long running sci-fi drama "Quantum Leap," Danny is a good-hearted chump based on Gene Kelly's provincial innocent from the "Broadway Melody" number in "Singin' in the Rain" who knocks on agents doors while belting out "Gotta dance.....!" Quickly cast as one of two cats in "Lil' Ark Angel," a Noah's Ark musical starring the allegedly adorable Darla Dimple, his dreams are shattered when he's canned for turning his one line ("Meow.") into a production number. Befriended by the other creatures on the set, he hatches a plan to show the studio heads that animals can be stars too. Meanwhile Darla, a terrorist take on Shirley Temple, plots to ruin him. "Cats Don't Dance" plays like a feature-length sketch from "Animaniacs," the side-splitting after school cartoon show Warner's animators have been successfully pumping out since the early 1990s. It is pratfalls and silly songs (contributed by Randy Newman), but with a follow-your-dreams message that gives the movie a heart. The quality of the art ranks about the same as "Animaniacs." It's not the rich landscapes Disney has focused on of late, but then who watches cartoons for the production design? The focus here is on the fun. The funniest moments in "Cats Don't Dance" come at the expense of the scheming Darla Dimple (volumously voiced by nine-year-old Ashley Peldon) and her colossus manservant Max, who are flooded, fried and eventually foiled. 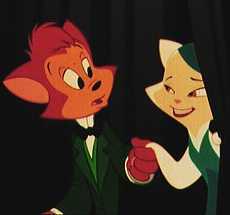 In fact, Darla and Max are far more entertaining than Danny and Sawyer (Jasmine Guy speaking, Natalie Cole singing), the tough-cookie girl cat who warms to the naive hero. The other animals are voiced by John Rhys-Davies (elephant), Kathy Najimy (hippo), Don Knotts (turtle), Hal Holbrook and Betty Lou Gershon (who did the voice of Cruella DeVil in the original "101 Dalmatians"). After getting all the animals fired from the studio, Danny rallies them together to hijack the premiere of "Lil' Ark Angel" with a rousing number that may find them the recognition they've been seeking all along, if it doesn't ruin them first. As the film is set in the 1930s -- the heyday of both Hollywood and movie cartoons -- it's also resplendent with animated celebrity sightings, as Warner Bros 'toons have always been wont to do. Bette Davis and Clark Gable have walk-ons, as do King Kong and Toto (it's an animal movie, remember).